In sciatica disease pain travels from hip region to foot. It causes travelling pain in leg.This pain occur in the region of sciatica nerve. 4. Abscess in the pelvic region. Mylein sheath of the sciatic nerve get inflammed. Spinal cord lumbar vertebrae 5th and sacrum 1st and 2nd vertebrae get collapsed with each other. 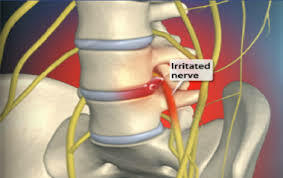 Sometimes it gets compressed due to pressure on intravertebral disc gets dislocated or bulge out. Sometimes inflammation is in the hip joint but the pain is referring in sciatic nerve. Patient has pain in sciatic nerve area. Pain aggravates on sneezing and coughing. During walking patient gait get disturbed. Pain aggravates on doing straight leg raising. Burning sensation on sciatic nerve area. On later stage muscles undergo dystrophy. Ayurveda consultation can solve your problem. Rule out diabetes and control it and take ayurveda consultation. For Disc compression and Arthritis induced sciatic nerve consult ayurveda. If you have spinal tuberculosis take Anti tuberculosis treatment and as a rejuvenation therapy take ayurveda tonics and medicine which help in speedy recovery and regeneration of myelin sheath of nerve and give strength to body. This entry was posted in ayurvedic consultation for sciatica, free online ayurvedic consultation, Healthcare, sciatica and ayurvedic treatment and tagged SCIATICA AND AYURVEDIC CONSULTATION, SCIATICA AND AYURVEDIC TREATMENT, SCIATICA AND YOGA, SCIATICA FREE AYURVEDIC CONSULTATION, spinal tuberculosis and ayurveda on December 11, 2014 by ayurvedicconsult.